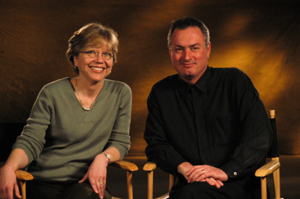 Imagine combining Carol Gray’s social stories with the power of video for our visual learners. That is what has happened with the collaboration between Carol Gray, Mark Shelley, and the Special Minds Foundation. 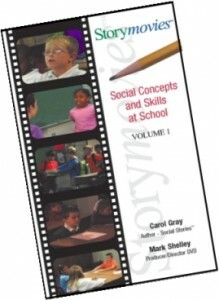 This is the first Volume in the planned series, and covers basic social concepts & skills at school. Future volumes will address a broad range of topics and target young children to adults. The foundation has raised donations to help produce these materials significantly reducing the cost of the product! The Social Concepts & Skills volume will not only be valuable for teachers, but also for parents helping prepare their children for school situations. Additionally, some of the situations are issues for both home and school. The product was designed for children with Aspergers and others on the autism spectrum; however it will also benefit any child with limited social skills. Storymovies, Volume 1, targets students developmentally 8-12 years old and includes 25 stories based on 9 movies. There are 2 versions: Standard Edition & Professional Edition. Both versions include the main color version DVD of the 25 stories and a user’s guide. The Professional version includes a black & white DVD version that is used for children distracted by color; a raw footage DVD that is useful for additional teaching and testing purposes; and a CD with printable pictures and related activities for generalization, practice, & review. Since Accelerations Educational Software has a mission to offer effective and affordable products, we are providing the product at a special 20% discount off of list to allow even more teachers and parents to be able to take advantage of this important tool.